The Durlston Marine Project is our community based marine awareness programme. 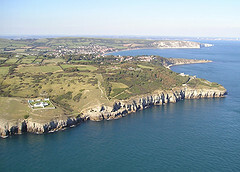 It focuses on the Durlston Marine Research Area - a voluntary marine study area that extends 25km along the Purbeck coastline from St. Aldhelm's Head to South Haven Point. The most striking feature of the area is its diversity. Shores face north, east and south while boulder strewn beaches, sand dunes, and towering limestone cliffs give way, beneath the waves, to sandy meadows and rocky reefs. The dramatic array of landscapes and seascapes support a huge diversity of wildlife and a wide range of human activities. The Durlston Marine Project aims to investigate, raise awareness and promote the wise management of this rich local marine environment. 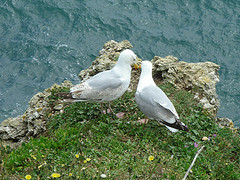 We study the important seabird colonies along the cliffs and the bottlenose dolphins that visit the local waters. Join our Dolphin Watch team. 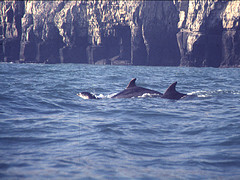 Report your sighting of dolphins, porpoises or seals. 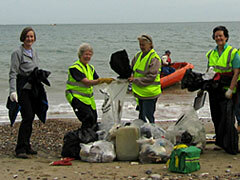 Help with our beach cleans. Or provide welcome hands-on help with our many community events. Durlston Marine Project works with other organisations and companies to promote awareness of marine issues. Durlston Marine Project is a member of Dorset Coastlink, which is a voluntary initiative to raise awareness of the relatively unknown marine environment.